Before Steve McQueen was a famous actor, he raced motorcycles. While he studied acting, he supported himself in part by competing in weekend motorcycle races, and reportedly bought his first motorcycle with his winnings. Throughout his career, he performed many of his own stunts in his movies. One of McQueen's most memorable movie performances was 1963's "The Great Escape", a Hollywood depiction of a mass escape from a World War II POW camp. It was a powerful movie, and the motorcycle chase scene is unforgettable. After escaping from a P.O.W. camp, Captain Virgil Hilts (played by McQueen), steals a motorcycle, and is then pursued by German soldiers. After eluding them for several miles, he successfully jumps a first line barbed-wire fence at the German-Swiss border into the Neutral Zone, only to become entangled in the second line of the barbed fence, and is re-captured. 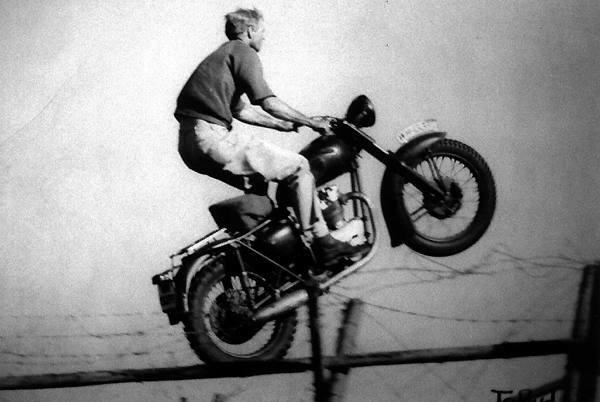 During the shooting of the movie, insurance concerns prevented McQueen from performing the classic motorcycle leap, which was actually done by Bud Ekins, who resembled McQueen from a distance. At one point, due to clever editing, Steve McQueen can be seen in a German uniform chasing himself on another bike. The motorcycles used during "The Great Escape" chase scene were 1961 Triumph TR6 Trophy models disguised as German BMW R75 motorcycles. Legend has it that Von Dutch converted the motorcycles for the movie while working at Ekins' shop. 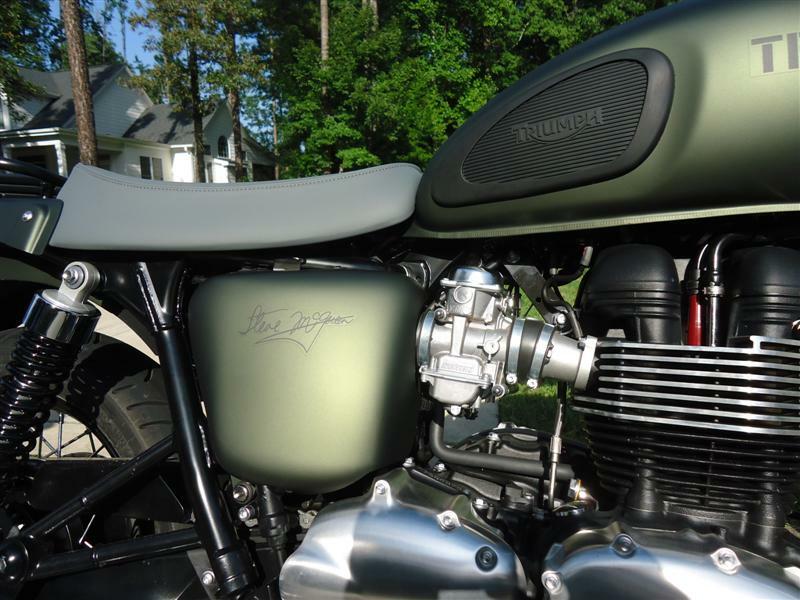 The Steve McQueen Triumph is inspired by the Trophy TR6 from "The Great Escape", and features a military-style Matte Khaki-Green finish, stencil-style Triumph decal on the tank and the actor's signature on the side covers. Beginning April 2012, 1,100 Special Edition bikes were produced and sold worldwide. 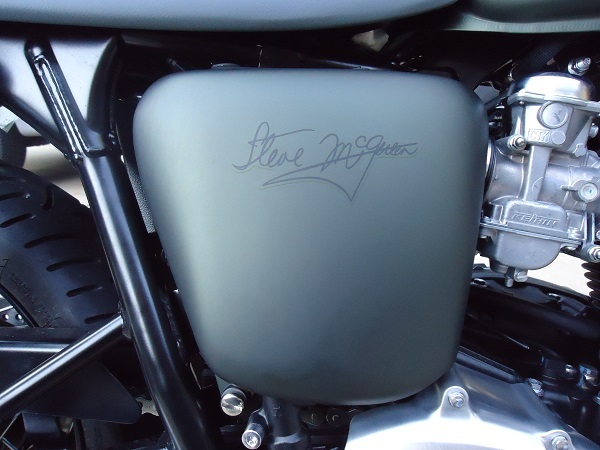 Each motorcycle is individually numbered with a plaque placed on the handlebar clamp, with owners receiving a certificate of authenticity. Based on the current Bonneville T100, the Steve McQueen Triumph is powered by an air-cooled, DOHC, parallel-twin engine. A bore/stroke ratio of 90x68mm gives a displacement of 865cc. 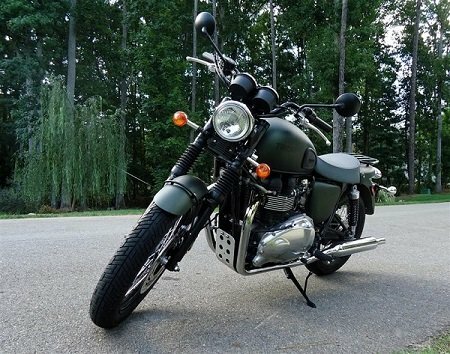 Fuel system is Triumph's multi-point sequential electronic fuel injection. 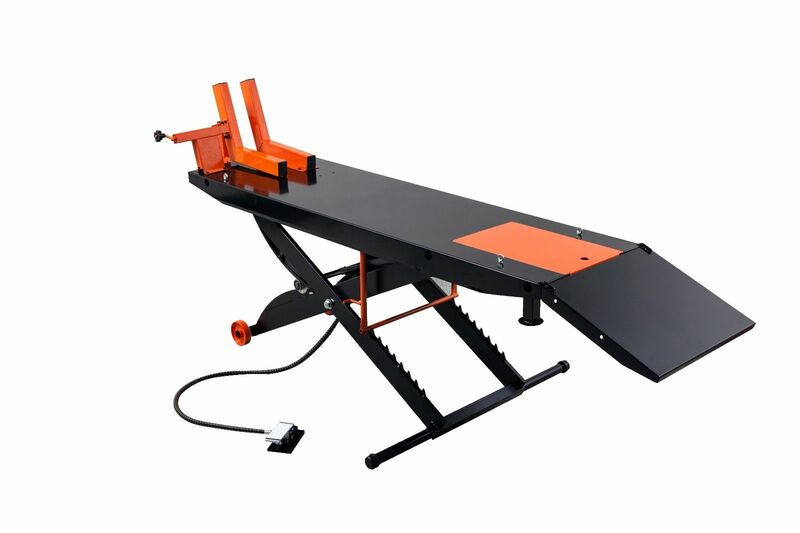 At 7500 rpm, power output is 67-horsepower, maximum torque is 50 ft/lbs at 5800 rpm. A 19" front tire is mounted on a black rim, with 36 chrome spokes laced to a black hub. In the rear, a 17" tire gets the same treatment on a 40-spoke rim. Handlebars, mirrors, and front forks are also black. Dual-piston brake calipers with single disc are used front and rear. In 1971, McQueen funded the motorcycle documentary "On Any Sunday", in which he is featured, along with racing legends Mert Lawwill and Malcolm Smith. Also that year, McQueen was featured on the cover of Sports Illustrated magazine riding a Husqvarna dirt bike. In 1974, Steve McQueen was the highest-paid movie star in the world. He was inducted in the Off-road Motorsports Hall of Fame in 1978. He died in 1980, and was posthumously inducted into the Motorcycle Hall of Fame in 1999. Along with many other colorful quotes, McQueen has said, "I'm not sure whether I'm an actor who races or a racer who acts."